42 / the tasting panel / august 2018 SOMM PROFILE W hen Ben Silver bought a magic kit as a young boy, he had no idea this childhood hobby would years later evolve into a full-blown career intertwined with his passion for wine. While growing up, Silver would practice magic at the breakfast table before school, showing off his tricks for family and friends during Shabbat dinners. "It was horren- dously bad, but people were polite," he says with a laugh. While his interest hardly waned once he left for school at San Diego State University, where he studied fine art, Silver didn't think he had any professional potential as a magician until he encountered one at one of his gallery shows. According to Silver, "that was a pivotal moment" for transforming a playful pastime into an actual job. To support his fledgling magician business, he dove into the hospitality industry, starting as a busboy before working as a bartender and server over a span of 18 years. While in Sedona, Arizona, he met a sommelier and, just like a sleight-of-hand trick, suddenly and inexplicably became enraptured by wine. "As you learn and taste more, you get that bug," Silver says. After passing his Level 1 course through The Court of Master Sommeliers, Silver moved to Santa Barbara, help- ing harvest grapes in the evening hours while working at the Kimpton Canary Hotel. He also visited his parents regularly in nearby Los Angeles, where he performed at the legendary Magic Castle in Hollywood and became further "immersed in the local wine industry," Silver says. After Santa Barbara's notoriously high cost of living prompted Silver to relocate to San Diego, he took a position as Wine Director at Mezé Greek Fusion in the city's historic Gaslamp Quarter district. While at a Southern Wine & Spirits trade tasting, he met Master Sommelier Fred Dame and performed a few magic tricks. Serendipitously enough, Dame then "graciously offered" to sponsor Silver for his Level 2 exam, which he also passed. Silver now primarily works corporate gigs and private parties, where he's also able to lead wine tastings or execute pairings with chefs while performing magic for guests. Regarding his personal tastes, he's particularly enamored by the Pinot Noir and Chardonnay of Oregon's Willamette Valley ("They show their terroir well," he says), not to mention Burgundy, older Bordeaux, and Greek wines. "People are enthralled by magic and wine," Silver says. "Wine really is magic—both of them are expressive art forms." 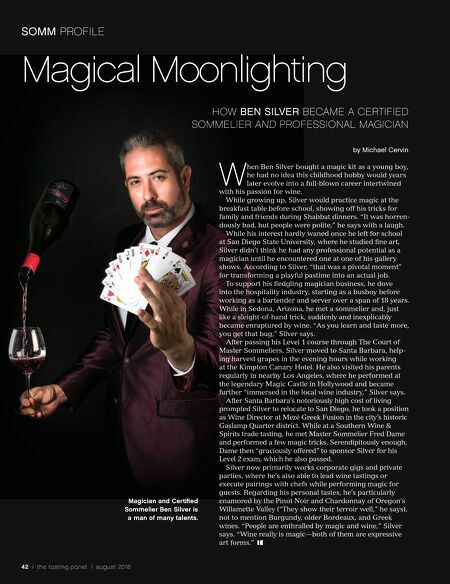 Magical Moonlighting HOW BEN SILVER BECAME A CERTIFIED SOMMELIER AND PROFESSIONAL MAGICIAN by Michael Cervin Magician and Certified Sommelier Ben Silver is a man of many talents. BROKE DA PALATE A Recap of the 37th Annual Kapalua Wine & Food Festival, the Longest- Running Event of Its Kind in the U.S.